Epithelial ovarian cancer (EOC) is second only to cervical cancer among the most common gynecological cancers and accounts for more deaths than all gynecological cancers combined. Despite extensive research, progress has been slow in understanding the pathobiology. EOC is identified as a heterogeneous malignancy with various histological subtypes. It is now well known that these different histological subtypes show differences in terms of presentation, response to treatment, immunohistochemical (IHC) reactivity, and molecular profiling. EOC is often diagnosed in the advanced stages of the disease usually after distant metastasis has occurred. This is probably due to lack of effective screening methods to detect the disease at an early stage. It responds poorly to conventional chemotherapy (paclitaxel/carboplatin), and at present, the 5-year survival of such patients is <20%. EOC has also been associated with mutations in human epidermal growth factor receptor 2 (HER2). The erythroblastosis oncogene B homolog 2 proto-oncogene encodes a transmembrane protein tyrosine kinase receptor involved in the development and progression of many cancers including ovarian cancer. Dysregulated HER2 signaling in ovarian cancer results from either gene amplification or overexpression and leads to faster cell growth, impaired DNA repair, and increased colony formation. These qualities would appear to make HER2 an attractive molecule for targeted immunotherapies in women with HER2-positive ovarian cancer. HER2 protein expression is most commonly detected via semiquantitative IHC analysis on paraffin-embedded tissues using established protocols employed for the assessment of breast cancer patients being considered for anti-HER2 Herceptin (trastuzumab) treatment. This study aims to determine the rate of expression of HER2 in EOC. Unfortunately, these data are rare in Nigeria. It is therefore hoped that the results from this study can serve as a basis to design clinical trials of anti-HER2/neu monoclonal antibody on EOC in Nigeria. It may also shed more light on the relationship between HER2/neu and behavior of EOC in Nigerian patients. Ethical approval was obtained from the Ethical Review Committee of the Faculty of Basic Medical Sciences, Nnamdi Azikiwe University, before the commencement of this research. This is a cross-sectional IHC study of EOC diagnosed at the two histopathology laboratories in Nnewi, Anambra state, namely Histopathology Department of Nnamdi Azikiwe University Teaching Hospital, Nnewi, and Pathocon Specialist Clinic and Research Institute, Nnewi. The hematoxylin and eosin (H and E) slides and paraffin blocks of all histologically diagnosed cases of epithelial ovarian carcinomas in these facilities from January 2005 to December 2016 were retrieved from the archives. Inclusion criteria were well-preserved tissue blocks with adequate data and tissue left for sectioning. Exclusion criteria were tissue blocks with inadequate tissue left for sectioning, cases with missing tissue blocks, and cases with incomplete data. Archival paraffin blocks of histologically normal ovaries in these laboratories were also retrieved to serve as controls. Known HER2/neu- positive breast cancer tumors were used as the positive control. As the negative control, tumor specimens were immunostained under the same conditions without the primary antibody. First, H and E-stained slides of these were reviewed for morphological consistency, and tumor grading was done according to the scoring system recommended by Shimizu et al. According to this scoring system, nuclear atypia (mild = 1, moderate = 2, severe = 3), mitotic activity (0–9 = 1, 10–24 = 2, more than 25 = 3), and architecture (glandular = 1, papillary = 2, solid = 3) were described and total score was counted as follows: Score 3–5 = grade 1, score 6–7 = grade 2, score 8–9 = grade 3. Grade 1 was considered low grade, while grades 2 and 3 were both considered high grade in keeping with current WHO grading. Then, sections were made from the tissue blocks and stained with HER2 immunostain. HER2/neu expression was evaluated using the HercepTest™ kit (Dako, USA), which uses a polyclonal rabbit antibody to detect HER2/neu. Staining was performed according to the protocol highlighted in the manufacturer's guide which accompanied the kit. The primary antibody, diluted 1:350, was applied to the sections, and incubated for 20 min. Then, HRP-labeled polymer anti-rabbit was applied as secondary antibody and incubated for 30 min. 3+: Circumferential membrane staining which is complete and intense, and within >10% of the tumor cells. Samples scored as 0 or 1+ were considered to be negative for HER2/neu expression, 2+ weakly positive, and 3+ strongly positive. Data were analyzed using simple descriptive statistics such as Chi-square test which was used to measure associations with level of significance P < 0.05. The above analysis was done using the Statistical Package for the Social Sciences (SPSS) 20.0; IBM; Chicago, IL, USA. Eighty-two EOC H and E slides and histology results were retrieved from the archives within the study period. The ages of the patients with EOC ranged from 23 to 90 years with a mean of 50.2 ± 13.0 years and modal age group of 41–50 years. Furthermore, 65.9% of cases occurred in those between 41 and 60 years of age, while 53.7% of patients were 50 years of age or younger [Figure 1]. The EOC cases consisted of 49 (59.8%) serous, 24 (29.3%) mucinous, and 8 (9.8%) endometrioid carcinomas as well as 1 (1.2%) malignant Brenner tumor. Twenty-nine (35.4%) of the tumors were low-grade neoplasms, and 53 cases (64.6%) were high grade [Table 1]. Thirty-two blocks were, however, excluded from the IHC study due to various factors including missing blocks and poor block condition, leading to poor antigen retrieval during IHC staining. Therefore, 50 EOC specimens were included in the IHC analysis. Also included in this study were 20 histologically normal ovaries. 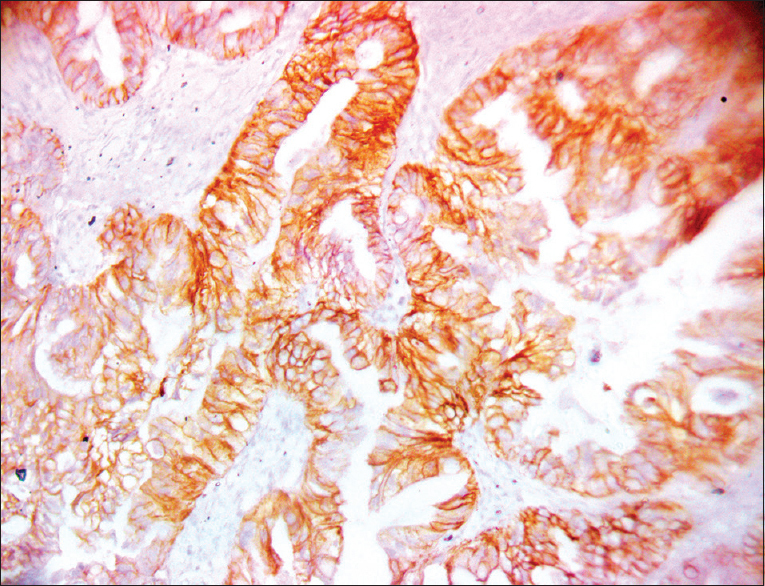 HER2/neu- positive staining was not observed in the histologically normal ovaries. However, 9 (18%) of the EOC showed HER2/neu- positive staining and five (10%) of these were strongly positive (a score of 3+), while four (8%) were moderately positive (a score of 2+). There was statistically significant difference in HER2 expression between normal ovaries and EOC (P = 0.016) [Table 2]. HER2 positivity within EOC was independent of age (χ2 = 2.245; P = 0.134) although there was more HER2 positivity among those older than 50 years (25%) than those 50 years and below (9.1%) [Table 3]. There was no significant association between tumor grade and HER2/neu expression (χ2 = 2.166; P = 0.141). However, HER2 positivity was most observed among low-grade carcinomas (29.4%) and least observed among high-grade carcinomas (12.1%) [Table 3]. Of the histological subtypes studied, mucinous EOC showed the highest HER2-positive rate with 35.7% of them being positive. This is followed by serous EOC which showed only 12.9% positivity rate. However, an association was not found between HER2/neu expression and histological subtyping (χ2 = 5.049; P = 0.080) [Table 3], [Figure 2] and [Figure 3]. Type 1 EOC showed higher HER2 positivity (26.1%) than Type 2 EOC (11.1%). However, this difference in HER2 expression did not reach statistical significance (χ2 = 1900; P = 0.168) [Table 3]. Malignant surface epithelial tumors of the ovary are generally more common in older women, between the ages of 45 and 65 years. This is evident in the present study. 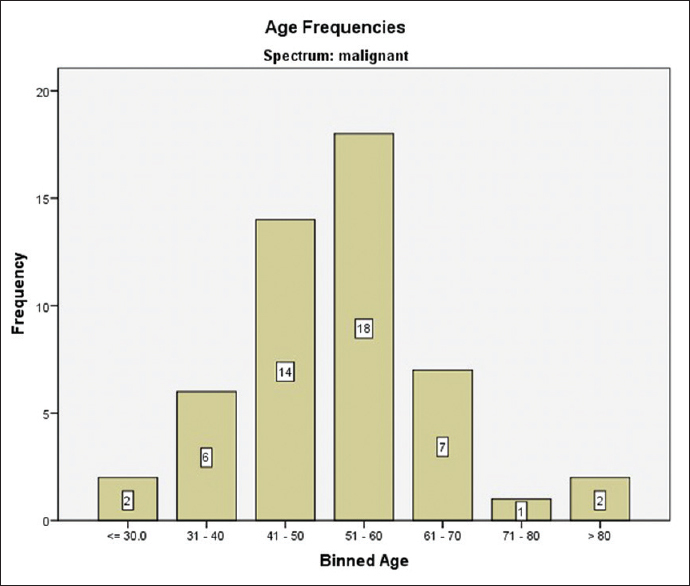 The age range of patients with EOC in this study was 23–90 years, with a mean of 50.2 ± 13.0 years, and 65.9% of cases occurred in those between 41 and 60 years of age, while 53.7% of patients were 50 years of age or younger. This is comparable to findings from other studies within and outside Nigeria, such as age range of 16–82 years, with a mean age of 52.2 ± 12.6 years reported in Ibadan, Nigeria, and age range of 24–78 years with mean of 51.26 ± 14.75 years reported in China. The higher prevalence of EOC in the older age group may be because the role of TP53 as guardian of the genome diminishes with age, as the probability of mutation increases. TP53 mutations account for approximately one-quarter of the aging-related rise in the worldwide incidence of all cancers. These significant associations between TP53 mutations and the rapid rise in cancer incidence with aging support a causal role for TP53. However, questions remain concerning the contribution of TP53 mutations to neoplastic development and the role of factors such as genetic instability, obesity, and gene deficiencies other than TP53 that reduce p53 activity. 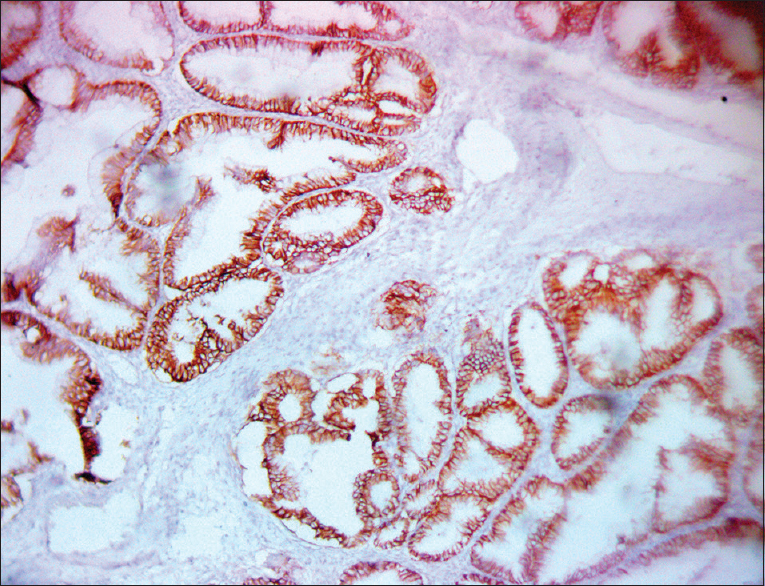 It has been reported that normal ovarian tissues almost do not show immunoreactivity for HER2 or show only faint staining., In the present study, HER2/neu- positive staining was observed in none of the normal ovarian tissues. Accordingly, this study also found a statistically significant difference in HER2 expression between normal ovaries and EOC (P < 0.05). HER2/neu- positive staining was found in 9 (18%) of the EOC, and five (10%) of these were strongly positive (a score of 3+), while four (8%) were moderately positive (a score of 2+). 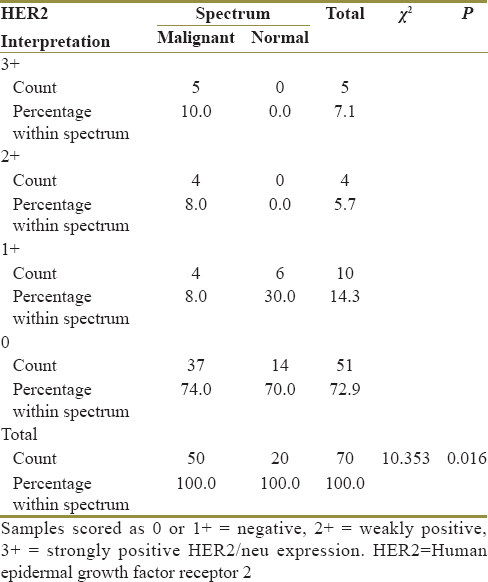 This figure is lower than that from the study done in Ibadan, Nigeria, in which HER2/neu positive staining was observed in 37% of the EOC; 20% were strongly positive (a score of 3+), while 17% were moderately positive (a score of 2+). This study however compares positively with other published works internationally. Demir et al. working in Turkey published an EOC HER2 positivity of 18.3% while Vermeij et al. working in Belgium published 19.4%., The rate of HER2 positivity varies in the literature from 8% to 66%. This variation in HER2/neu expression rate in different studies may be attributable to the type of materials analyzed (fresh or paraffin-embedded), technique applied (IHC and/or fluorescence in situ hybridization [FISH]), differences in the specificity of the antibodies used as well as variance in staining protocols and subjective interpretation of sample stains. What is important however is that a sizeable fraction of EOC among Nigerian patients is HER2 positive and these patients may therefore benefit from HER2-targeted therapy especially for those with chemoresistant tumors. These data therefore support the clinical investigation of HER2-targeted antibody evaluation in chemotherapy-insensitive/resistant ovarian cancer in Nigerian patients with EOC. HER2 positivity in EOC was independent of age (P = 0.134) although there was more HER2 positivity among those older than 50 years (25%) than those 50 years and below (9.1%). Demir et al. also reported a higher HER2 positivity in EOC patients older than 50 years (18.8%) compared to those 50 years and below (17.6%); similarly, they also found no association between age and HER2 expression. In the study by Wang et al., there was more HER2 positivity among those older than 60 years (35.3%) compared with those 60 years and below (29.9%); this however was also not statistically significant. Ajani et al. in Ibadan, Nigeria, also found no significant association between HER2/neu expression and age. It is also noteworthy, though not of statistical significance, that among mucinous EOC, patients with HER2-positive tumors are usually younger than patients with HER2-negative tumors.,, This could not be investigated in the current study due to the small number of mucinous EOC in this cohort. Ovarian mucinous tumors tend to have a poor prognosis in advanced stages and response to chemotherapy is generally poor in comparison to other histologic subtypes of ovarian cancer. There is mounting evidence that distinct mutations and genomic aberrations exist in each histological subtype of ovarian cancers, suggesting that treatment of ovarian cancer could be stratified according to histology subtypes. In this study, Type 1 EOC showed higher HER2 positivity (26.1%) than Type 2 EOC (11.1%). Although this difference in HER2 expression did not reach statistical significance (P = 0.168), our findings, like previous studies, support the hypothesis of the dualistic model of ovarian carcinogenesis giving rise to Type 1 (low-grade serous, mucinous, endometrioid, and clear cell carcinomas) and Type 2 (high-grade serous carcinoma, mixed Müllerian tumor, and undifferentiated carcinoma) EOC. In Type 1 tumors, the most frequent genetic abnormality are the mutations of KRAS, BRAF, and HER2 genes, while Type 2 tumors show mainly mutation of the p53 gene. Perfect agreement between IHC, FISH, and chromogenic in situ hybridization (CISH) for IHC-negative (0 or 1+) or IHC-positive (IHC 3+) cases has been reported, indicating that IHC can be used as the primary testing modality. CISH and FISH were also equivalent in the evaluation of IHC 2+ cases; however, a higher rate of uninterpretable cases was observed with FISH and this technique also requires time-sensitive interpretation (due to fluorescent signal decay) and a fluorescent microscope and costs more. They therefore recommended IHC testing, and if equivocal (IHC 2+), CISH validation should be performed. The unavailability of either FISH or CISH in the country and financial constraints to seek these outside the country constituted a major limitation in the index study. An increased understanding of the importance of histologic subtype in EOC has resulted in an increased emphasis on understanding the molecular changes, leading to the development of tumor subtypes with the goal of targeted therapy specific to each subtype. For those patients whose tumors demonstrate overexpression and amplification of HER2, targeted therapy with trastuzumab (± conventional chemotherapy) can be considered. HER2 immunopositivity was found in 18% of EOC but not in normal ovaries. The difference was statistically significant. Although a higher expression was found in mucinous tumors compared to other subtypes, HER2/neu expression in EOC was not significantly associated with histologic subtyping, tumor grade or age of the patient. Overall these data suggest that the proto-oncogene, HER2/neu is mutated in EOC among Nigerian patients. It also supports the dualistic model of ovarian carcinogenesis in which HER2 mutation is important in mucinous carcinomas (Type 1 EOC) but not in Type 2 tumors. Hence, ovarian carcinogenesis in Nigerian patients is not different from that reported in the literature on their counterparts in other parts of the world. This study recommends further studies involving FISH and multicenter studies from other parts of Nigeria to determine the true extent and pattern of these mutations nationwide. It is also recommended that further studies to determine the efficacy of HER2/neu monoclonal antibodies in the treatment of EOC in these patients should be carried out. Kurman RJ, Carcangiu M, Herrington C, Young R. Tumours of the ovary. In: WHO Classification of Tumours of Female Reproductive Organs. Lyon: IARC Press; 2014. p. 12-3. Madhuri TK, Tailor A, Haagsma B, Coley H, Butler-Manuel S. Relevance of immunohistochemical expression of p57kip2 in epithelial ovarian carcinoma – A systematic literature review. J Ovarian Res 2012;5:46. Verri E, Guglielmini P, Puntoni M, Perdelli L, Papadia A, Lorenzi P, et al. HER2/neu oncoprotein overexpression in epithelial ovarian cancer: Evaluation of its prevalence and prognostic significance. Clinical study. Oncology 2005;68:154-61. Ajani M, Salami A, Awolude O, Oluwasola A, Akang E. The expression status of human epidermal growth factor receptor 2 in epithelial ovarian cancer in Ibadan, Nigeria. South Afr J Gynaecol Oncol 2016;8:9-13. Lanitis E, Dangaj D, Hagemann IS, Song DG, Best A, Sandaltzopoulos R, et al. Primary human ovarian epithelial cancer cells broadly express HER2 at immunologically-detectable levels. PLoS One 2012;7:e49829. McAlpine JN, Wiegand KC, Vang R, Ronnett BM, Adamiak A, Köbel M, et al. HER2 overexpression and amplification is present in a subset of ovarian mucinous carcinomas and can be targeted with trastuzumab therapy. BMC Cancer 2009;9:433. Høgdall EV, Christensen L, Kjaer SK, Blaakaer J, Bock JE, Glud E, et al. Distribution of HER-2 overexpression in ovarian carcinoma tissue and its prognostic value in patients with ovarian carcinoma: From the Danish MALOVA ovarian cancer study. Cancer 2003;98:66-73. Berchuck A, Kamel A, Whitaker R, Kerns B, Olt G, Kinney R, et al. Overexpression of HER-2/neu is associated with poor survival in advanced epithelial ovarian cancer. Cancer Res 1990;50:4087-91. Shimizu Y, Kamoi S, Amada S, Akiyama F, Silverberg SG. Toward the development of a universal grading system for ovarian epithelial carcinoma: Testing of a proposed system in a series of 461 patients with uniform treatment and follow-up. Cancer 1998;82:893-901. Wang D, Zhu H, Ye Q, Wang C, Xu Y. Prognostic value of KIF2A and HER2-neu overexpression in patients with epithelial ovarian cancer. Medicine (Baltimore) 2016;95:e2803. Richardson RB. P53 mutations associated with aging-related rise in cancer incidence rates. Cell Cycle 2013;12:2468-78. Cai Y, Wang J, Zhang L, Wu D, Yu D, Tian X, et al. Expressions of fatty acid synthase and HER2 are correlated with poor prognosis of ovarian cancer. Med Oncol 2015;32:391. Mohammed RA, Makboul R, Elsers DA, Elsaba TM, Thalab AM, Shaaban OM, et al. Pattern of HER-2 gene amplification and protein expression in benign, borderline, and malignant ovarian serous and mucinous neoplasms. Int J Gynecol Pathol 2017;36:50-7. Demir L, Yigit S, Sadullahoglu C, Akyol M, Cokmert S, Kucukzeybek Y, et al. Hormone receptor, HER2/NEU and EGFR expression in ovarian carcinoma – Is here a prognostic phenotype? Asian Pac J Cancer Prev 2014;15:9739-45. Vermeij J, Teugels E, Bourgain C, Xiangming J, in 't Veld P, Ghislain V, et al. Genomic activation of the EGFR and HER2-neu genes in a significant proportion of invasive epithelial ovarian cancers. BMC Cancer 2008;8:3. Tuefferd M, Couturier J, Penault-Llorca F, Vincent-Salomon A, Broët P, Guastalla JP, et al. HER2 status in ovarian carcinomas: A multicenter GINECO study of 320 patients. PLoS One 2007;2:e1138. Anglesio MS, Kommoss S, Tolcher MC, Clarke B, Galletta L, Porter H, et al. Molecular characterization of mucinous ovarian tumours supports a stratified treatment approach with HER2 targeting in 19% of carcinomas. J Pathol 2013;229:111-20. Chay WY, Chew SH, Ong WS, Busmanis I, Li X, Thung S, et al. HER2 amplification and clinicopathological characteristics in a large Asian cohort of rare mucinous ovarian cancer. PLoS One 2013;8:e61565. Pils D, Pinter A, Reibenwein J, Alfanz A, Horak P, Schmid BC, et al. In ovarian cancer the prognostic influence of HER2/neu is not dependent on the CXCR4/SDF-1 signalling pathway. Br J Cancer 2007;96:485-91. Omar N, Yan B, Salto-Tellez M. HER2: An emerging biomarker in non-breast and non-gastric cancers. Pathogenesis 2015;2:1-9. Vereczkey I, Serester O, Dobos J, Gallai M, Szakács O, Szentirmay Z, et al. Molecular characterization of 103 ovarian serous and mucinous tumors. Pathol Oncol Res 2011;17:551-9. Kurman RJ, Shih IeM. Molecular pathogenesis and extraovarian origin of epithelial ovarian cancer – Shifting the paradigm. Hum Pathol 2011;42:918-31.